In 1982 my four-year old daughter Malka was attending her first day at a Catholic pre-school in a small town in Italy. I was stationed there as a Navy chaplain for the U.S. Sixth Fleet, and the hope was that Malka’s school would help her learn Italian and make some friends outside the base. However, waiting for her school bus to return I began to wonder whether I had adequately prepared her for a school run by nuns in traditional black habits. Did she even know what a nun was? The stories we know become the prism through which we view the world: the foundation and framework for our vision. Had she grown up with anti-Catholic stories, her first encounter with nuns might have been filled with fear or hatred, not happiness and excitement, in the way stories of “the other” prepare children in so many parts of the world, including the Mid-East. An old saying teaches that we believe what we see, but the reverse is often true: we see what we believe. And what we believe is often colored by the stories we’ve learned. When Abraham told the story of one God creating the universe, the idea of history – the belief that we can learn from our past — was created. After all, if there were many gods, as so much of the ancient world believed, what happened yesterday might have no bearing on today, because we might be dealing with a different god. But with one God there could be one plan and one set of rules, so learning from the past – from yesterday, from our parents, or from the lives of our ancestors – became both possible and essential. No wonder that the Tanakh, the Jewish Bible, not only records the victories of the Jewish people, like the hieroglyphics do for the Egyptians, but also our failures. We must learn from both. David Ben-Gurion, Israel’s first Prime Minister, understood the power of stories when he had Adolph Eichmann captured and publicly tried in the first televised trial in the history of television. Ben-Gurion wanted the story of the Holocaust/Shoa told, so that misperceptions could be corrected and lessons could be learned. He wanted a new generation of men and women who came of age after WWII, during a time when many of those who experienced the war or the Holocaust first-hand kept silent about them, to hear and to learn in a way that would make them remember. Peoples, nations, cultures, faiths: all have stories that inform their vision and help shape their thinking. For many Americans, our national story is one that was re-envisioned and re-imagined after the Civil War, through the words of leaders like President Lincoln: words so powerfully describing our nation’s new burst of freedom, and our government of the people, by the people, and for the people, that the frequently used phrase these United States would be set aside in favor of the more-straightforward, more unified the United States. For many Christians, the world is seen through the story of death and resurrection. 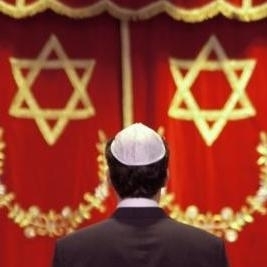 For many Muslims, through the image of struggle and war – at the very least, spiritual struggle and war – between Dar al Islam and Dar al Harb, the Islamic and non-Islamic “worlds.” For Jews, our vision is one of leaving the slavery of the past, wandering through the wilderness of the present, and moving toward the promised land of the future. Significantly, while so many other peoples spoke of “the golden age of the past,” Judaism’s story put the best of times in the future. And so, whether or not Judaism and Christianity agree on the “identity” of the messiah, it is the Jewish vision that laid the groundwork for the belief in messianic times for so many people of the world. So important is the Jewish belief in the power of stories – and in particular, our Jewish story – that four times in the Bible we are commanded to tell our story to our children, whether or not they ask to hear it. Three times in the portion Bo in Exodus/Shmot we’re taught to tell the story, twice linked to a child’s question and once not; and once in the portion Vaetchanan in Deuteronomy/Dvarim, again as a response to a question. This four-fold repetition of the command to tell our story raised questions in the minds of the ancient rabbis, teachers who believed that nothing in the Bible was superfluous: no extra word, and not even an extra letter, could exist without meaning. Therefore, the rabbis taught, we are commanded to tell the story four times because we must tell it in four different ways, because there are four different kinds of children. One size does not fit all. This teaching is the foundation for the haggadah’s four children section, traditionally referred to as the four sons. In a way, the image of the four children is an early example of personality profiles like Myers-Briggs: a reminder that differences in individuals must drive differences in the ways we interrelate with them. Educationally, it is linked to the verse in Proverbs/Mishlei (22:6) that teaches chanoch l’naar al pi darko – teach a child according to his or her way: an approach that would eventually become the basis of today’s Montessori schools! sheh-ayno yodaya lishol: one who does not know how to (or does not care to) ask – the one I will call the detached child, not engaged or involved in any way. The haggadah’s image of four children has sometimes been explained as stages in our life as we age, parts of our personality, or even, more metaphorically, as generational differences, as we’ve moved from “the old country” to (for those of us in the U.S.) life in America. Of course, neither indicators like the Myers-Briggs personality types nor the haggadah’s four children should make us think that human beings – ourselves or others – easily or completely fit into any one category. Instead, we are presented with archetypes that help us understand the trait or approach that is most prominent in a person’s general attitude or during a particular exchange. To understand these four Jewish archetypes, it’s important to remember that “quadruples” in Judaism, sets of four, are often best understood based on the interplay (combinations and permutations) of two major factors or characteristics. So for example, the four species we use during Sukkot can be compared and contrasted through the characteristics of taste and smell: the etrog or citron has both, the willow has neither, the palm has taste but no smell, and the myrtle has smell but no taste. Similarly, individuals can be understood based on knowledge and good deeds: some with only the first or only the second, some with both, and some with neither. This approach can be applied to the four types of children we have as well. Towson University Professor Russell Jay Hendel has suggested that the two categories for the children might be knowledge and respect, but for me the best approach is head and heart: what educators might call cognitive and affective approaches to learning and teaching. The tam – the simple or “pure” child – represents the heart without the head. When a simple question is asked, a simple answer should suffice. This might be a child for whom pure faith is enough, and who seeks a spiritual connection, not an intellectual understanding. The rasha – the wicked — represents the head without the heart. When the only connection is intellectual, it is easy to become a skeptic or cynic: an outsider with no emotional commitment to give foundation to a struggle to understand, let alone embrace, what is not yet understood. The Bible’s description of this child’s words make those words sound like a question (“what is…?”), but the verb says is used, not asks. For me, this child’s words represent so-called questions that are not questions at all: they are challenges, attacks, or put-downs. Two people can ask the same “question,” but while one’s words sound like a request for information, the other’s make our blood boil, putting us on the defensive, and making us feel we are under attack. That’s because we are. When I worked on Holocaust remembrance materials for the military, one question that was frequently asked of me was why six million Jews should be remembered in a separate way from the millions of others who died during the war. For a serious question, there was a serious answer. But I knew that sometimes there was no question at all behind those words. Finally, the sheh-ayno yodaya lishol – the detached child, the one who does not know how to ask or is not interested enough to ask – is the one with no connection, neither head nor heart. The danger is that this child represents so many of our children today: perhaps not yet completely lost, but not at all involved. The late Lubavitcher rebbe once taught there is a fifth child: the one who does not come to the seder at all. But if we understand this fourth child as detached and uninvolved, then no discussion of a fifth child is needed. However, we should understand that while the Passover Seder might be our tradition’s foremost attempt to engage our children and tell our story, we should never believe this one night is sufficient. Whether or not a child is physically present at the seder, we cannot always be sure he or she is really “with us” as the story is told that night. In any event, dealing with children who are so apathetic that they have no interest at all in our traditions and beliefs – in our story – presents parents and the community with the challenge to find other ways to engage. But does not know how to ask can also describe an altogether different child: one who literally has never learned to ask because all past efforts have been rebuked; one who never imagines that his or her question might be heard or considered; one taught to remain silent, because he or she has nothing worthwhile to say. Perhaps, like Abraham’s wife Sarah — about whom the midrash recounts that she died of a heart attack when she heard the news of the akedah (the binding of Isaac), learning that her husband had come so close to sacrificing their son – some individuals (or whole groups of individuals) are left out of the most important discussions and decisions of all. They are left to suffer consequences over which they had no power and no say. In other words, some individuals are detached and apathetic because they have not yet been successfully engaged; but others are detached – bewildered, even, at the thought of asking a question — because they are so often ignored and excluded; or because they are brainwashed, battered, or numb. It is important to note that even the so-called wicked child is still engaged. The Broadway musical Wicked, a play about the “Wicked Witch of the West” in the Wizard of Oz, makes the point that some individuals we call wicked might be misunderstood, even ultimately representing the best in us after all, challenging the system through engagement with it. The detached child, on the other hand, may not yet be lost, but without a connection to serve as lifeline to the Jewish story, that child may ultimately drift away completely, from the Jewish people and the Jewish faith. Four times we are commanded to tell our story to our children, to pass along the Jewish message to the next generation. It is a story that does not turn a blind eye to suffering, but it is one that sees hope in the future. One lesson from our stories should be to keep faith that better times – the best of times – are yet to be. No Jew should ever be taken in by the belief that “the situation is hopeless” or “things will never change.” Our story should drive our vision and our most basic belief: that the world can change for the better, and we can be part of that change. But we should remember the lesson of the four children: we must work to understand each individual and hear each question before we respond. Otherwise, we may be providing answers important to ourselves, not those important to our students or children. For example, when I was in college, many Jewish teachers were touting Judaism as “the most rational” of religions, demythologizing it to show how reasonable it was. Partly as a result of that approach, I think, many of my contemporaries turned at least temporarily to faiths like Buddhism and Hinduism, in search of spirituality and mystery, not rationality. Perhaps, at least at that time in their lives, the questions so many young people were asking were more those of the simple child than any of the others, but their questions were not answered, and probably not even heard. Our hope is that all our children – every Jew – will be connected to our people and our faith with head and heart, but we should begin to teach and begin to share based on where each child and each person is now. Jewish teaching explains the verse “the God of Abraham, the God of Isaac, and the God of Jacob” – as opposed to “the God of Abraham, Isaac, and Jacob” – as a lesson that each of us must struggle with faith until that “faith relationship” becomes personal: becomes our own. We must never forget that we are part of a community, learning the lessons of the past and the stories passed down to us. But we each must wrestle like Jacob did with the angel, even to the point that it hurts or wounds us to do so, until our relationship with God, with Torah, and with Israel becomes uniquely ours. That faith relationship must be one that touches our minds and our hearts: our lives and our souls. Then, through us – as individuals and as a people — our stories will continue to touch, inspire, and eventually even repair the world.